Begin my November chasing after Running Man. Yes! 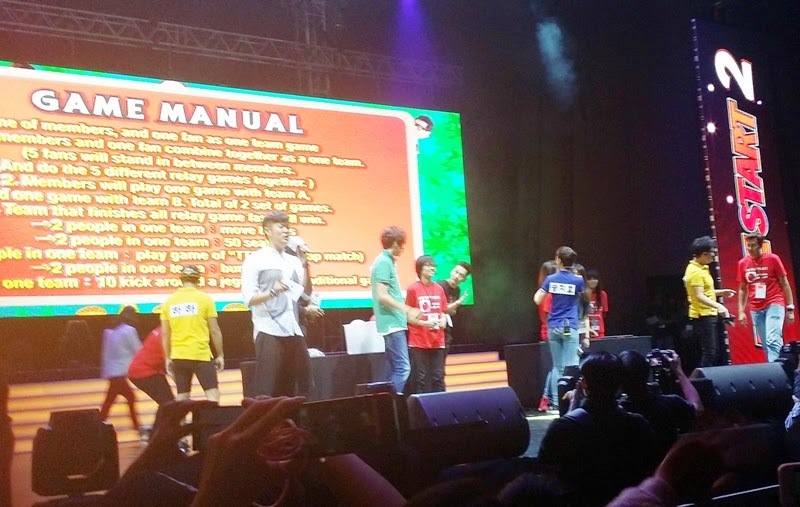 Running Man in Malaysia for their Race Start Season 2 Fan Meeting organized by ONE HD. 5 of South Korea’s hottest stars were in town for Malaysia’s biggest fan meeting of the year. Scream for Lee Kwang Soo, Song Ji Hyo, Kim Jong Kook, Haha (Ha Dong Hoon) & Ji Suk Jin. On Saturday 1st November morning was the press conference at DoubleTree by Hilton and later they adjourned to Paradigm Mall for autograph session and then final biggest fan meeting was held in Stadium Negara in the evening. It was a massive crowd of over 2,500 fans last evening at Stadium Negara in Kuala Lumpur with interactive musical concert – complete with stage games, song performances and video montages of memorable scenes from the series. As usually the Running Man never failed to tickle their fans with their quirky banter and antics plus their charming performances. One of the highlights of the evening was when the ‘Easy Brothers’ Lee Kwang Soo and Ji Suk Jin, surprised the fans with a parody of ‘Trouble Maker’ sparking roaring laughter and cheers. OMG! The stage games was so hilarious, that Pepero Challenge between Lee Kwang Soo and a lucky fan was really crazy… So many were screaming and some cried (I don’t know why). I think all Kwang Soo’s fans will surely envy that lucky person. The evening was especially significant for 23 lucky Malaysian fans, who won a once-in-a-lifetime opportunity to join the stars on stage for fun and games. In the spirit of Running Man challenges, the entertaining stage activities. The entire cast also joined an image guessing game that put fans and the cast to the test by imitating the image on screen for the last person to guess correctly. The two-hour long fan meet extravaganza closed on a high note with 2 encore performances by all the cast members. Over 4,000 Malaysian fans gathered for the autograph session at Paradigm Mall. Mobs of excited fans from all across Malaysia arrived at as early as 6.00am to get a good vantage point of their favourite Running Man stars. The autograph session saw the Running Man cast signing exclusive Race Start posters for winners of sponsors’ contests and VIP ticket holders of the fan meeting. Running Man is the No.1 rated show in its timeslot across all pay-TV channels in Malaysia among pay-TV audiences 4+ in the year to date. In Malaysia, the ratings are higher than all the other channels, including the free-to-air channels. I'm so jealous right now!! >_< Ji Hyo!! Kwang Soo!